General Rental Agreement, Campground Rental Agreement and a Rent Five Day Notice of Non-Payment letter for your small business along with Open-Ended Security Agreement (Sample), Open-Ended Promissory Note (Sample), Telecommuting Checklist and Agreement (Sample) and Sample Agreement to Form Business Entity. and the amount of rent for the term. The Campground Rental Agreement is an agreement used for renting out campgrounds. This helps to guarantee any cleaning costs, damages, and/or other charges. Does the rent cover all the utilities? This should be in the rental agreement. The landlord and the prospective tenant together should check every plumbing fixture, light switch, cabinet door, and appliances to make sure they work properly. If the landlord or tenant agrees to fix any repairs this should be in the rental agreement along with a time frame in which repairs have to be completed. The rental agreement should also note if there is a major appliance included such as a refrigerator, stove, etc. Is parking available? If so, is there a fee involved and is this included in the rent? Will the landlord or the tenant be responsible for shoveling snow/ice from the walks in the winter? Is it plowed from the parking area or driveway? Is there a fee involved and who pays for it? The Rent Five Day Notice of Non-Payment letter is below also for you to download, modify and print. 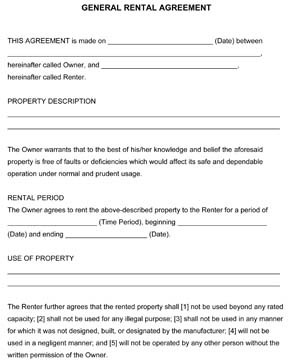 You will need this rent notice form if the person renting your home, building, etc. has not made a payment and you need to give them fair notice before action is taken. Open-Ended Promissory Note (Sample) – This contract is a signed document containing a written promise to pay a stated sum to a specified person or the bearer at a specified date or on demand. Open-Ended Security Agreement (Sample) – This contract is a signed document containing an agreement of obligations between the borrower and the secured party. Sample Agreement to Form Business Entity – This contract can be used when two or more individuals decide to form a business entity together. Telecommuting Checklist & Agreement (Sample) – This contract is a signed document containing an agreement of obligations between the telecommuter and the employer.